Dvd - dragon ball - complete - 3 boxes. 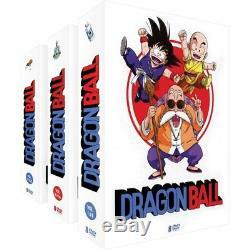 Dragon ball - complete - 3 boxes (25 dvd) the complete of the famous TV series dragon ball! Songoku is a very naive and innocent young boy. However, although very small, he has phenomenal strength. Living isolated in a forest, he takes his time chasing monsters or fishing huge fish for his lunch. He meets bulma in unpleasant circumstances. Bulma's car hit him violently, but luckily the boy came out unscathed. At first angry to see his damaged locomotion machine, bulma persuaded Sangoku to accompany him to search for the seven legendary crystal balls which, once united, allow the appearance of a huge dragon named Shepherd, who can grant any wish. Bulma, who believes in this legend and the electronics having no secrets for her, has built a pocket radar that detects balls. 3 boxes - 25 dvd - full - 153 episodes - 3970 min - fruitioners: akira toriyama, okazaki minoru, daisuke nishio, takao koyama, shunsuke kikuchiformat: color, palaudio: french region: region 2 this dvd will probably not be displayed outside of europe. Number of discs: 25studio: ab vidodate of the DVD release: October 21st, 2016 duration: 3970 minutes. 3 boxes - 25 dvd - full - 153 episodes - 3970 min - director: akira toriyama, okazaki minoru, nishio daisuke, takao koyama, shunsuke kikuchi format: color, pal audio: french region: region 2 this dvd will probably not be viewed outside Europe. Number of discs: 25 studio: ab video date of release of the DVD: October 21, 2016 duration: 3970 minutes. We do not deliver post boxes or military bases, thank you to take into account when ordering. Followed letter - 0.00. Post - international economic mail - 7.90. For more information on delivery, click on more info. Sorry, our products are not available for withdrawal in store. On request, we offer the possibility to pay by bank transfer. No checks will be accepted. The law n 81-766 of August 10, 1981 relative to the price of the book, known as law lang (of the name of jack lang, minister of the culture), is a law establishing a unique price of the book in France. Ask the seller a question. Manga - academy alice (the) vol. Manga - princess sakura vol. Manga - nijika, dream actress, tome 3. Manga - nijika, dream actress, tome 5. To contact the customer service, simply click on the button and we will be happy to assist you. Delivery is free for this item (metropolitan France only). Upon request, we accept payment by transfer. The object must be returned within 14 days after receipt. For an object to be returned, it must be in the same condition as when it was received, the packaging must be present and in good condition (not torn), all parts, accessories and notices must be included in the return. Please note that according to the regulations in force, the right of withdrawal can not be exercised for customizable books, audio recordings, video or computer software unsealed by the customer .. books will not be resumed if they show traces folds, pages cornea, writing ..
the item "dvd dragon ball integral 3 boxes" is on sale since Wednesday, July 4, 2018. It is in the category "dvd, cinema \ dvd, blu-ray". The seller is "around_the_clock" and is located in /leans. This item can be shipped to the following country: europe.